�����As we have previously pointed out, there is a shift in collecting and investing habits of buyers of rare coins and bullion. With the multitude of mints worldwide producing bullion coins and medals with low premiums, much of the current cash reserves are being spent on these not-so-rare items. With this, less money is being spent on rare coins leading to a restructuring of prices. �����Long time followers of the rare coin market, those with 40+ years of experience, have seen at least nine market cycles in which the mood shifted from positive to negative or vice versa. With this latest downturn created by an immense interest in bullion related coins also comes an opportunity to purchase rare coins at a discount. With prices being very fluid, quality is of utmost importance. We are constantly seeing bargains in the market that do not seem to make sense. With the grading services, PCGS and NGC, receiving so much respect for accuracy in grading coins, it is rather odd to see coins that sell at such high discounts of the current levels. �����Mint State Franklin Half Dollars are a popular series among collectors because they have a solid history and it is short enough to be able to complete a set without breaking the bank. However, if you get into Full Bell Lines and are looking for high grades, they can be extremely difficult to locate because of competing Registry collectors. The rarest date by value in MS65 is the 1953 S FBL. The reverse is softly struck and the Bell Lines are typically weak. There are only 30 MS65�s certified by PCGS and NGC combined with just two grading higher in MS66 by PCGS. Yet, we have seen the value of the MS65 drop over the last 2 � years from an FMV of $30,630 to the current $21,560; this is down over $9,000 or about one-third of its value since the beginning of 2014. �����According to the Heritage auction archives, they have sold five coins at auction since January 2014 ranging from $28,200 down to $14,100. Again, our current FMV is at $21,560, while PCGS retail lists this coin at $20,000 and NGC lists it at $32,500. This is just one example of many rarities that have fallen on hard times due to the surge in collectors and investors acquiring modern bullion coins. �����The Proof 1853 Seated Dime with Arrows has always been a very popular coin with dealers and collectors; best guess is that it had an original mintage of just five coins. However, there are a total of 9 coins certified in all Proof grades, some most likely being resubmissions. The highest grade is PR66 and one of those is a PCGS + coin. Yet, since the beginning of 2014 the FMV for the PR65 has dropped from $74,380 to the current $43,130; down over $30,000. The latest auction result for this date was from this year�s January FUN Show; a price realized of $29,376 for a PCGS PR65 CAC. NGC shows a value of $85,000 and PCGS is at $40,000. Despite record sales for many top coin companies across the country, current prices would indicate we are in the midst of a downward cycle and from past history we could expect to see a reversal in the near future. �����The 1813 Capped Bust $5 Gold is extremely rare, with an original mintage of just 95,428. It is also the only denomination minted in Gold with the date 1813. It is actually affordable in MS63 and lower grades, however, as you move to the MS64 and higher, the prices jump dramatically. The MS64 has an FMV of $55,630 and the MS65 is at $120,250. While the MS65 shows a total of six coins certified, the MS66 is listed with just two with none higher, although one of these is a MS66+ coin. In January 2014 the MS66 had an FMV of $344,500 and today it is $260,000. This can happen when the market loses just a small percentage of its high-end collector/investors. The competition, or lack thereof, forces prices lower as sellers search for the highest buyers. While the lower market creates opportunities like this one where the value seems to have fallen $84,500 in just 2 � years, this is still an immensely rare coin. PCGS lists a retail value of $225,000 and NGC, while they do not list any certified for the MS66 grade in their population report, gives it a high value of $300,000. �����The 1913 S $5 Gold Indian has hundreds of coins certified in MS63 and lower grades, however, there are only 30 in all higher grades with MS66 the highest. The original mintage of this date was 408,000, but because many were lost due to meltings, this date is considered rare in all Mint State grades, especially the MS65 and MS66 with just five coins certified in the two grades. The MS64 has been as high as $39,830 in early 2015. The current FMV is $27,340, down a whopping $12,490. What causes a coin this rare to fall this much? With 25 coins certified in this grade, the lower value would suggest that the coin may have been overpriced in the first place or there are simply better value coins available. PCGS shows this coin to be valued at $24,500 and NGC has it at $37,500. �����The 1876 S $20 Gold Liberty is the last date in the Type II series. Type II�s are so rare that we have only three dates with an FMV in the MS65 grade: 1869, 1873 Open 3, and 1876 S. There are a total of four 1876 S MS65�s certified by PCGS and NGC and there are none higher and only one of these coins has the CAC sticker. Nonetheless, this coin has also dropped in price since early 2014 when the FMV was $227,500; the current FMV is $182,000. If you wanted to purchase this date in this grade but were hesitant back in 2014, assuming you could find one at today�s market, you would be saving $45,500 due to this current mediocre marketplace cycle. The current NGC price guide lists this date at $265,000, while PCGS shows $205,000. �����Just because a coin falls in value does not necessarily mean that it is a good buy at the new lower level. A case in point is the 1913 Lincoln Cent in PR66 Red. This coin has dropped from $4,340 early this year to the current FMV of $3,470. There are 44 coins certified in PR66 and another two having the + designation; there are also 15 in PR67. However, like in any Copper series, this coin can suffer from spotting or unpleasant toning. This means that if you can locate a coin that is better than average for this grade and has good eye appeal with no spots, you may want to consider it for purchase. Since the 1913 is an older Copper Cent, and most were likely stored poorly over the years, they are equally likely to have spotting. NGC lists it at $4,750 and PCGS $3,700. �����With prices down for so many rarities, there appears to be opportunities to make profits with future recouping values. The best place to start is with past pricing history; where prices were at the peak of the last cycle and where they are today. Bargains are everywhere; but it takes time and study to locate the right ones. 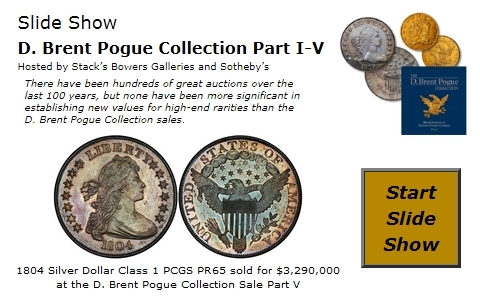 �����All of the prices listed for PCGS and NGC are courtesy of the Heritage Auctions archives.